Observers have vetted the board of directors of IPM Council of Canada, and have concluded that half of the members IPM Council of Canada have close ties to organizations that support arbitrary and reckless prohibition against conventional pest control products, such as Landscape Ontario. Consequently, observers are not surprised that IPM Council of Canada has betrayed the golf industry in Ontario ― in the past, decision-makers from Landscape Ontario have earned a similar reputation of betraying industries like professional lawn care. Some of these very same decision-makers from Landscape Ontario, who now operate IPM Council of Canada, are repeating their bad decisions all over again. Observers have concluded that anyone with close ties to Landscape Ontario, like Tony DiGiovanni, should NEVER be allowed to serve on the IPM Council’s board of directors. At this time, the golf industry is facing its worst attack campaign perpetrated by malevolent and vengeful fanatics whose ultimate goal is to harm and destroy of all golf facilities. Throughout the summer of 2016, golf-hating fanatics have been pilfering the web-site of the IPM Council of Canada, www.ipmcouncilcanada.org/, which serves as an unsecured storage recipient for sensitive data containing detailed reports on the use of pest control products by hundreds of golf facilities. This misappropriation of data from the IPM Council web-site has been organized by a revenge-obsessed enviro-fanatical leader who holds the golf industry falsely accountable for the sad death of her son as a result of his supposed exposure to pest control products used by golf facilities near her home. Since June 21st, 2016, observers have pointed out that the IPM Council of Canada has a duty to protect the golf industry’s businesses from harm and destruction ― it must IMMEDIATELY SHUT-DOWN ITS WEB-SITE. Unfortunately, the IPM Council REFUSES TO SHUT-DOWN ITS WEB-SITE ― this organization and its directors, like Tony DiGiovanni, have been deemed unfit to serve the golf industry. Observers have concluded that anyone with close ties to Landscape Ontario should NEVER be allowed to serve on the IPM Council’s board of directors. Strategic plan implementation, industry spokesperson, public relations, support and advice. Oversees all projects and activities carried out by the Membership Services Team. Landscape Ontario is a trade organization that supports the arbitrary prohibition against conventional pest control products ― Landscape Ontario’s reckless decision torpedoed and destroyed businesses operating in the professional lawn care industry. Landscape Ontario was founded in 1973 by combining three separate horticultural associations into one. The original organizations were ― Ontario Garden Maintenance and Landscape Association, Ontario Landscape Contractors Association, and Ontario Nurseryman’s Association. Landscape Ontario serves 10 related sectors of horticulture and has more than 2,000 member companies. 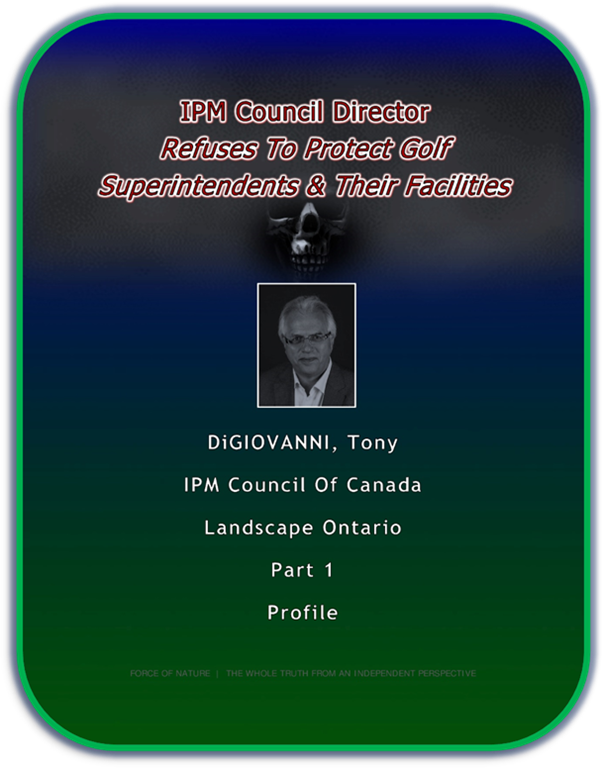 Tony DiGiovanni’s IPM Council of Canada REFUSES to IMMEDIATELY SHUT-DOWN its web-site in order to PROTECT golf superintendents and their facilities from the WORST ATTACK CAMPAIGN ever perpetrated against the golf industry, code-named « Golf Course Pesticides Project ». Is your refusal or inability to act because you agree with other board members who may operate as golf-hating & anti-pesticide fanatics ?!?! Is your refusal or inability to act because the IPM Council of Canada has operated as an anti-pesticide & environmental-terrorist organization ?!?! • 50 per cent ( one-half ) of the board members at IPM Council have CLOSE TIES with organizations that SUPPORT anti-pesticide prohibition, like Golf Canada, Canadian Cancer Society, Landscape Ontario, Neudorff Canada, New Democratic Party of Canada, and World Wildlife Fund. • Nearly half, 40 per cent, of the board members at IPM Council have DIRECT CLOSE TIES with Landscape Ontario, an organization that supports the arbitrary prohibition against conventional pest control products ― Landscape Ontario’s reckless decision torpedoed and destroyed businesses operating in the Professional Lawn Care Industry. 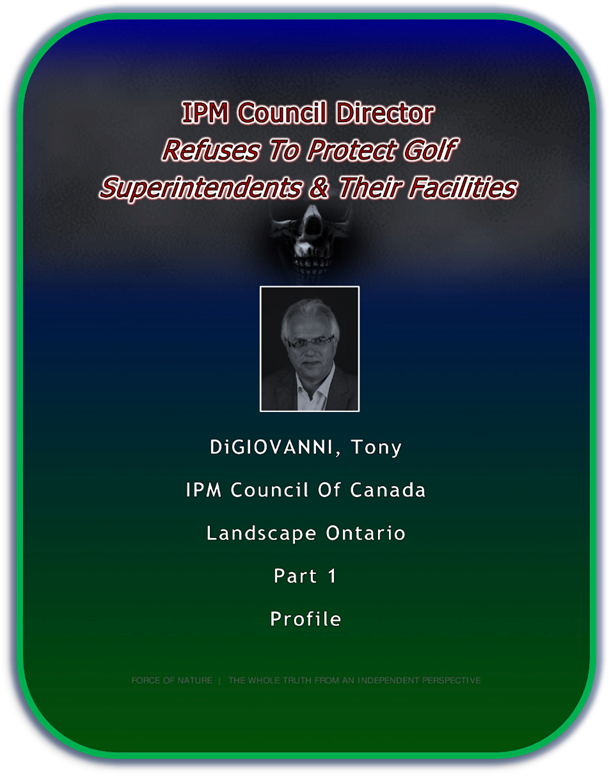 • It comes as NO SURPRISE that the very same IPM Council board members who TORPEDOED AND DESTROYED the professional lawn care industry while serving as elected officials and administrative staff at Landscape Ontario in 2009 would now, in 2016, REFUSE TO RECOGNIZE THE IMMINENT AND ELEVATED THREAT against golf superintendents and their facilities ! • 85 per cent of the board members at IPM Council have NOTHING IN COMMON with the golf industry ― they COULD NOT CARE LESS about golf superintendents and their facilities ― they COULD NOT CARE LESS about the IMMINENT AND ELEVATED THREAT OF HACKING-ATTACK CAMPAIGN against Ontario’s golf industry. • The MAJORITY of board members at IPM Council should NEVER have been allowed to serve on the IPM Council’s board of directors ― they are NOT FIT to be ENTRUSTED with the SAFE-KEEPING of SENSITIVE IPM DATA that will be used TO ATTACK, TO HUMILIATE, TO DAMAGE, AND TO DESTROY golf superintendents and their facilities. DiGiovanni’s Landscape Ontario has never been trustworthy or reliable on matters concerning the prohibition against pest control products used in the urban landscape. 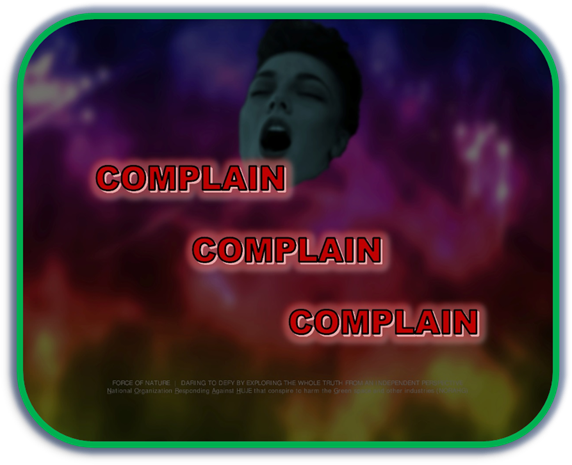 Complain, Complain, Complain About Tony DiGiovanni ! The golf industry’s owners, directors, managers, and superintendents must COMPLAIN IMMEDIATELY TO ALL BOARD MEMBERS of the IPM Council, including Tony DiGiovanni ! DiGiovanni REFUSES to protect the golf industry’s IPM Data ― contact himand demand that the IPM Web-Site be shut-down NOW ! The golf industry is under the elevated threat of hacking-attack campaign perpetrated by golf-hating fanatics who are pilfering sensitive and potentially-harmful information about Ontario’s golf facilities ! Throughout the months of June and July, 2016, messages were sent by e-mail ordering the hacking-attack campaign against the golf industry. The master-mind of this hacking-attack campaign is a revenge-obsessed fanatical enviro-leader who holds the golf industry falsely accountable for the sad death of her son as a result of his supposed exposure to pest control products used by golf facilities near her home. So far, the IPM Council has been given at least twelve distinct and detailed warnings ! TWELVE !